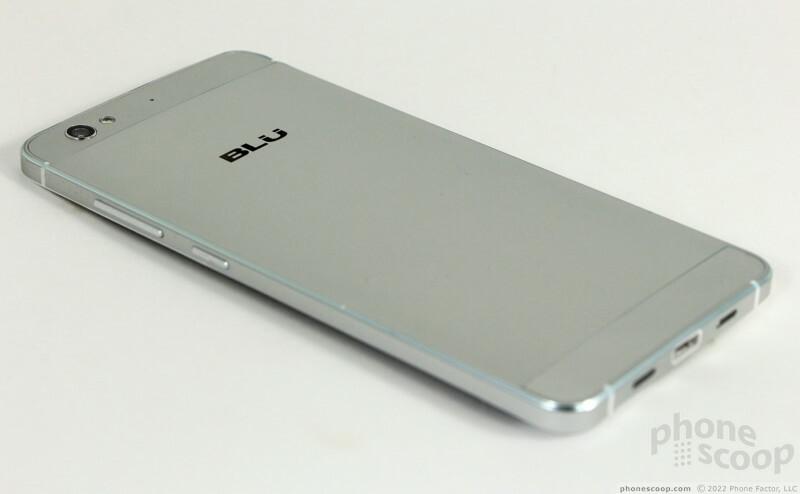 Blu is selling the Vivo 5 directly to consumers unlocked. 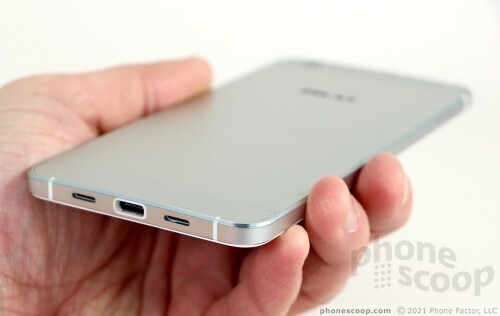 This Android device is slim, attractive, and made from good materials. It boasts a big screen, solid camera, exceptional battery, and compatibility with AT&T and T-Mobile. 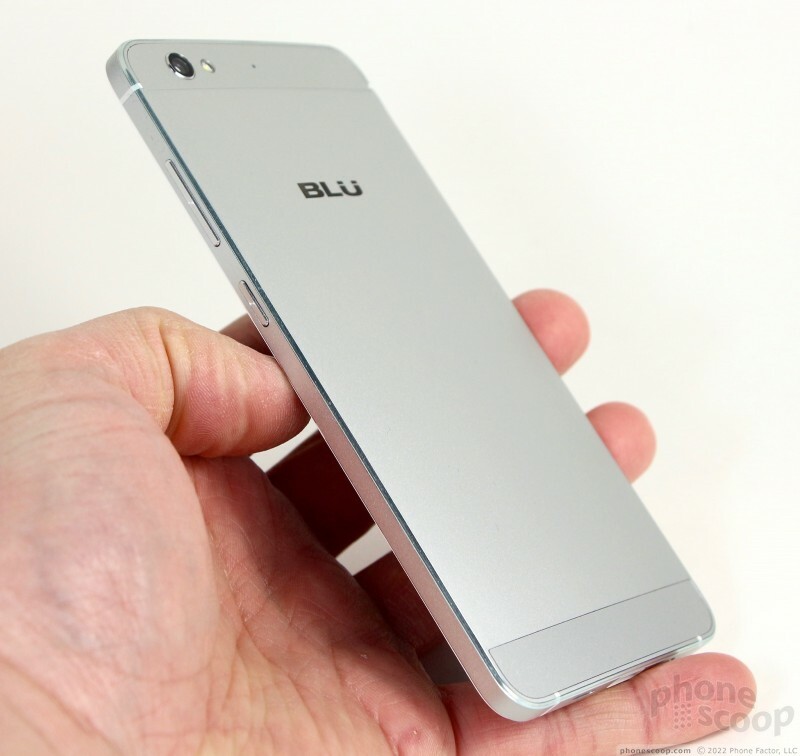 Here is Phonescoop's in-depth report about Blu's latest. The Blu Vivo 5 is a mid-range handset that should appeal to those who prefer unlocked phones that have a bit of class. The Vivo isn't available from carriers, so you'll have to seek it out online yourself. It targets the affordable premium category and manages to get most things right. The V5 could easily be mistaken for a high-end phone. 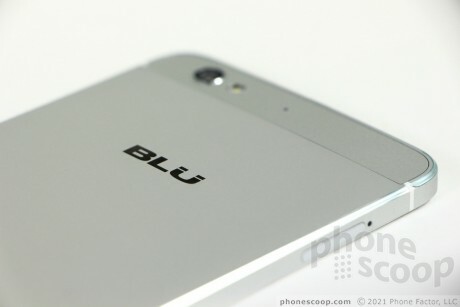 Blu chose to dress the handset in aluminum and glass, and its thin profile gives the V5 all the earmarks of a flagship. It's not a flagship, but it could pass for one, and that's probably the point. Carrying the Blu Vivo 5 will let you blend in with the hip crowds. 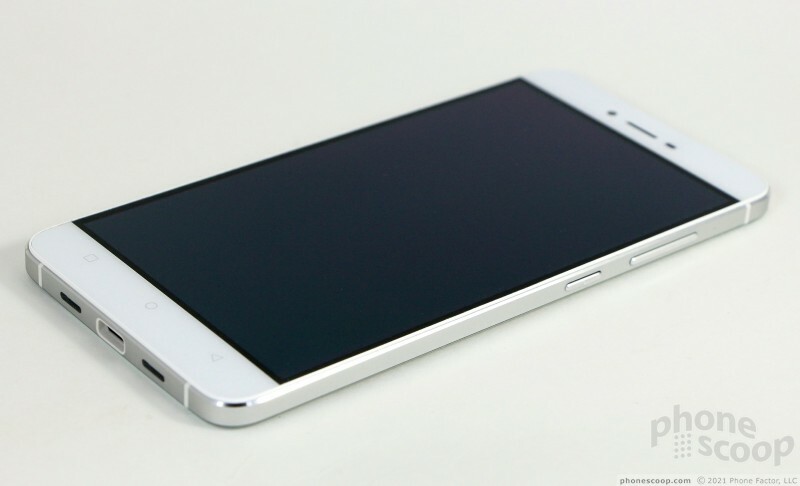 The Vivo 5's design is conservative, but appealing in its simplicity. It is a slim slab that comes in either gold or silver/white. The metal has a smooth finish and Blu was sure to polish the chamfered edges to a nice shine. At a glance, you might think the Vivo 5 is flat, but it is not; the back surface has a slightly curved shape. 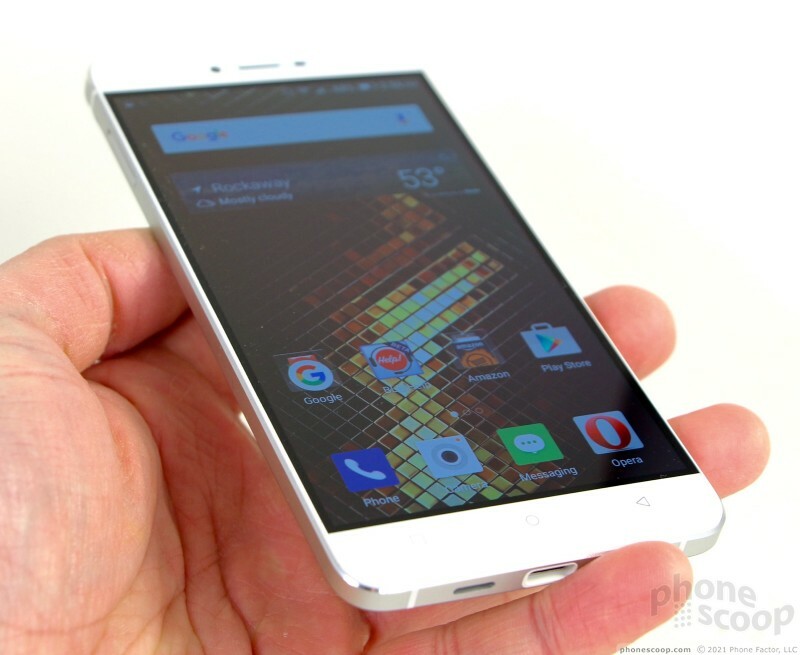 The Vivo 5 is a sharp-looking handset. At 5.98 inches tall and 2.94 inches wide, the Vivo 5 is a large handset. It's not quite as bulky as the Moto X, nor as tall as the Nexus 6P, but it's close in size to those phones. 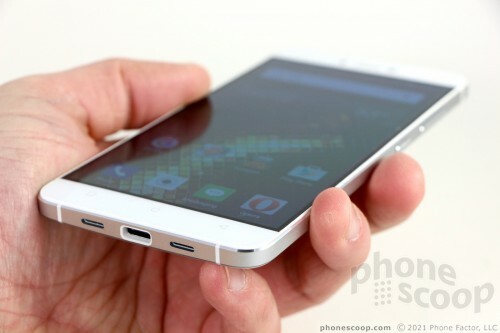 The width of the phone and the sharp, flat side edges detract from hand comfort. The chamfers help prevent the phone from cutting into your flesh, but only fractionally. 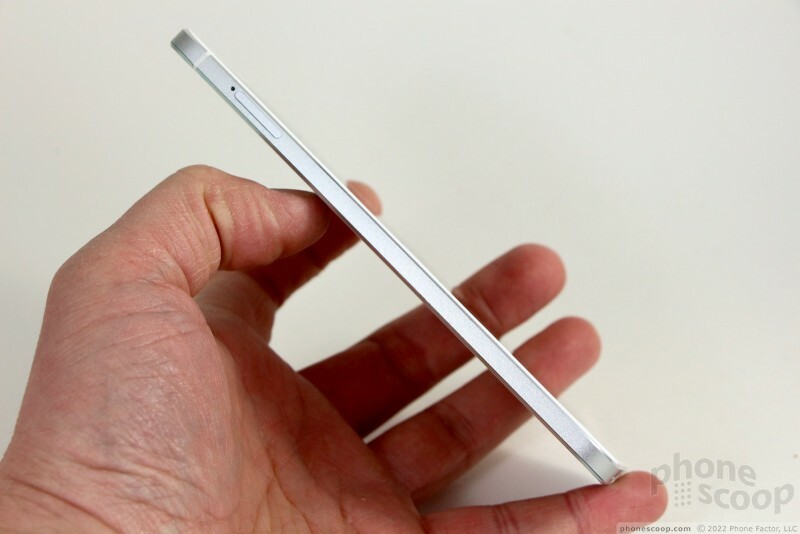 The Vivo 5's 6.7mm profile is one of the thinnest out there. The aluminum doesn't feel as strong or weighty as the metal used in high-end phones such as the LG G5 or Apple iPhone. Perhaps Blu used a thinner gauge metal. The glass panel feels good under your thumb and is fitted into the frame with care. The phone is assembled tightly and the fit and finish are fine. Due to its size, the Vivo 5 is tough to use one-handed. My thumb can reach only half the display comfortably. I often found myself adjusting my grip to reach the top edge of the screen; Just as often, I used my other hand instead. You should have no trouble carrying the phone around. It slips into pockets with ease. 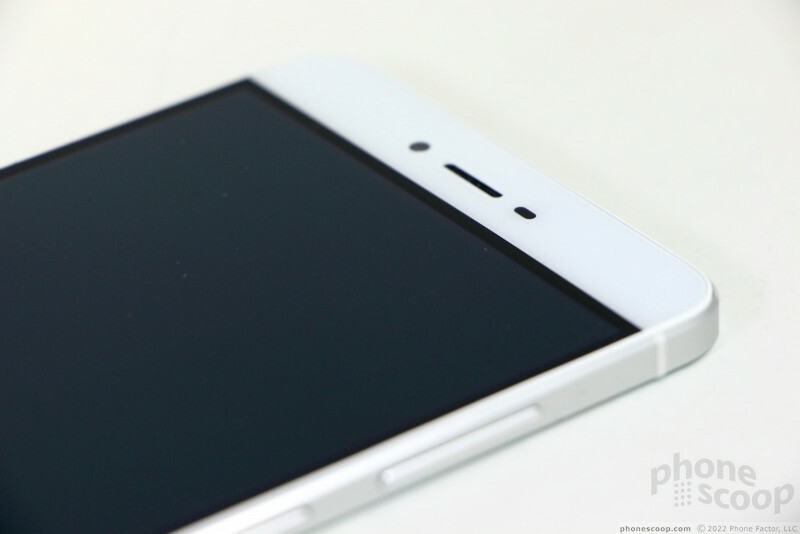 I like the clean and simple front surface of the phone. The screen fills the majority of the front, but there are generous bezels above and below the display. A small, metal screen covers the hole cut into the glass for the earpiece speaker. A camera and sensor are visible on either side of the grille. Blu decided to go with hardware buttons, so you'll note three capacitive keys (multitask, home, back) below the display. I didn't have any trouble using these keys. Blu put the volume toggle and screen lock key on the right edge of the phone. These controls are slim, but their profiles are raised enough to make them easy to find and use. I was pleased with travel and feedback of both. 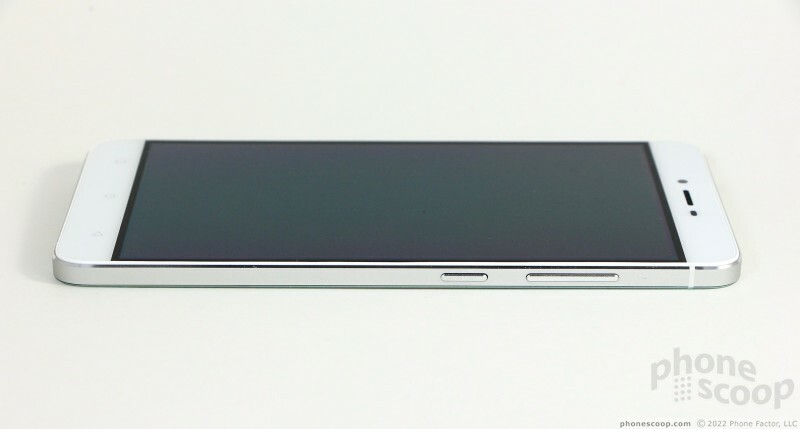 There's a card tray tucked into the left edge of the Vivo 5. It can hold either two SIM cards, or one SIM card and a micro SD memory card. The tray will accept either micro or nano SIM cards, which gives you some flexibility. The headset jack is on top. 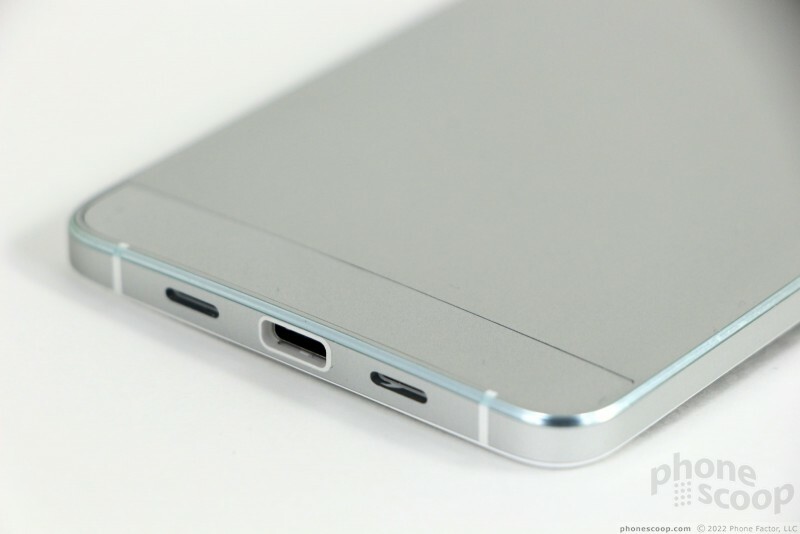 The Vivo 5 includes a USB Type-C port for charging and data transfer. The Type-C port is appealing because it is reversible (easier to use), quick at pushing data, and can send power in both directions. However, Type-C cords and accessories are still a rare commodity and have not yet become commonplace. 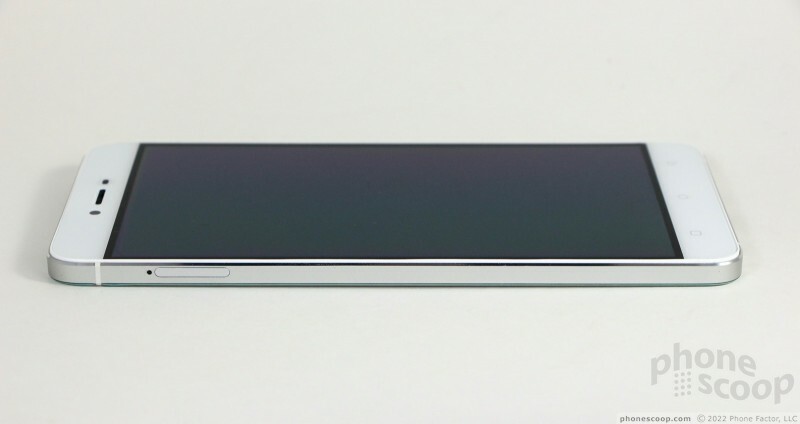 The Vivo 5's speaker is also placed in the bottom edge of the phone. 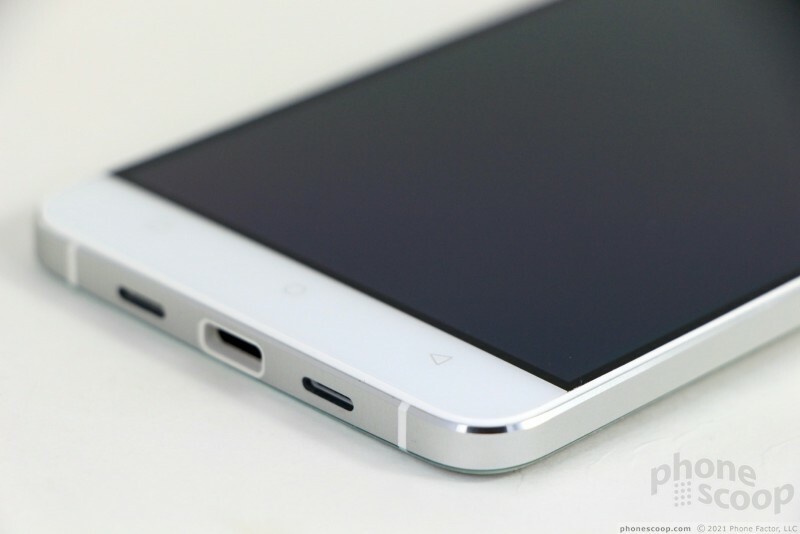 Like most all-metal phones, the Vivo 5 is sealed up. The back panel cannot be removed and the battery is snugly entombed within. The rear surface is mostly uniform metal, with the exception of plastic panels at the top and bottom, for the antennas. Those panels are almost the same color as the metal, but not quite. The Vivo 5 is well-designed and well-made. 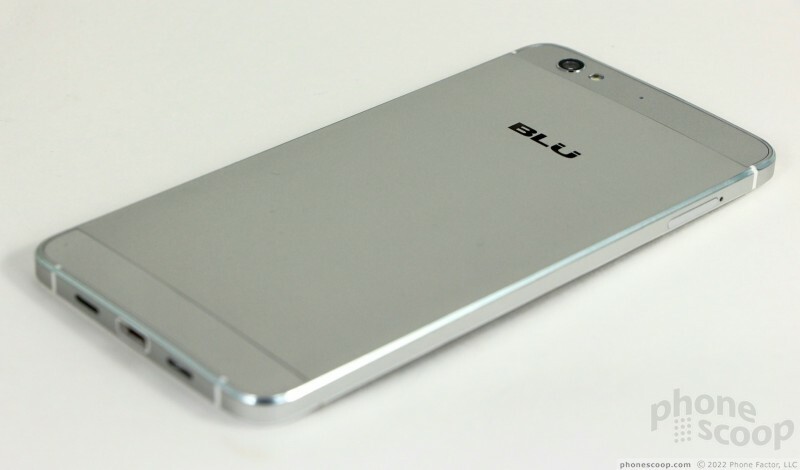 Blu gave the Vivo 5 a 5.5-inch 720p HD screen. I was worried the large panel and mid-range resolution would be a bad pairing, but those fears were unfounded. 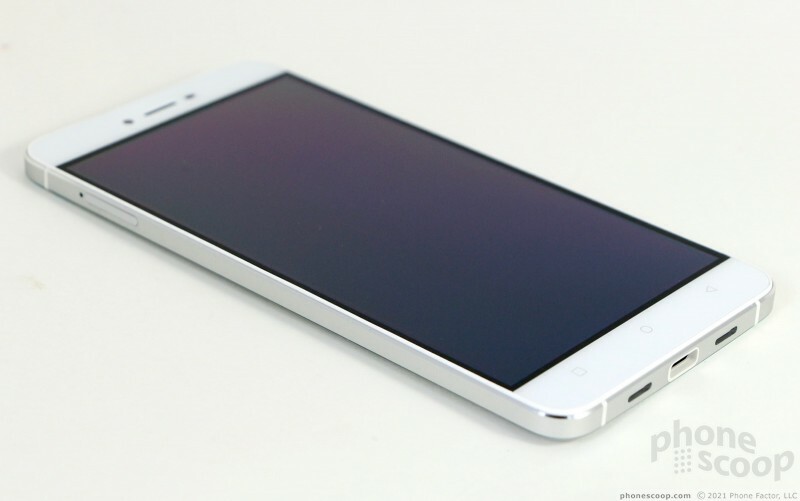 The Vivo 5's display looks quite good. Your eyes cannot see individual pixels, and on-screen graphics appear sharp. You'll be able to use the phone outdoors as long as you set the brightness up all the way. Colors are accurate, but there's a noticeable blue shift when you tilt the phone side-to-side. That means viewing angles aren't the best. Still, it's a fine screen for a phone in this class. The Vivo 5 is sold unlocked and is sort of compatible with the networks operated by AT&T and T-Mobile (and their prepaid services, Cricket and MetroPCS.) The phone supports LTE bands 2, 4, and 7, which are 1900 MHz, 1700 MHz, and 2600 MHz, respectively. That means no low-band spectrum (700 MHz AKA band 12/17) for either AT&T or T-Mobile. I tested the Vivo 5 on both AT&T and T-Mobile around New York City. On AT&T's network, it found LTE (4G) about half the time and connected to HSPA (3G) the rest of the time. 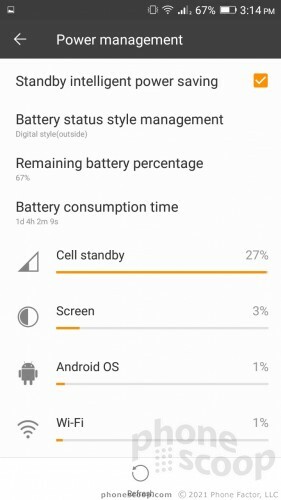 For T-Mobile, the Vivo 5 rarely connected to LTE and instead offered HSPA service the majority of the time I tested it. In other words, don't count on getting a reliable 4G LTE signal with this phone. On both networks, the Vivo 5 connected most calls on the first dial, but missed calls here and there. Data speeds were below average across the board. I was able to use the phone for simple browsing and checking email or the weather, but more network-intensive operations, such as downloading apps or watching YouTube, varied greatly in performance. The Vivo 5 performed better overall on AT&T's network in my experience. I found the Blu Vivo 5 to offer average voice quality. The clarity of voices in the earpiece speaker is pleasing and callers have a warm tone, but the volume levels just aren't good enough. I was forced to keep the volume set all the way up at all times and even then couldn't hear calls in normal places, like the car or outside. The Vivo 5's phone is most usable when indoors. Coffee shops and other public spots overwhelm it quite easily. People I spoke to through the Vivo 5 said I sounded pretty good. The speakerphone added a layer of distortion over calls that detracted from clarity. Paired with poor volume output, and the speakerphone is all but useless anywhere other than a quiet spot. The ringers and alerts are acceptable, but I did miss some calls because the vibrate alert is a bit subtle. Battery life is one of the Vivo 5's strong points. 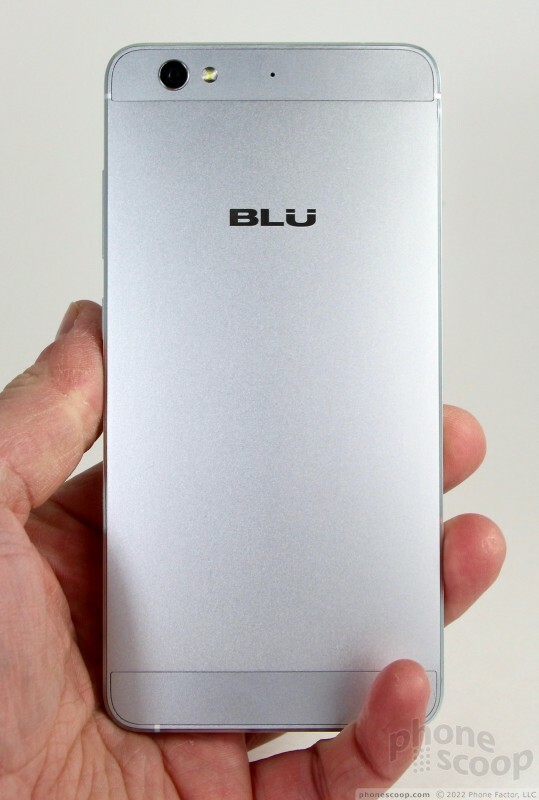 Blu somehow jammed a 3,150 mAh battery into the phone's slender profile and it delivers big time. The phone consistently pushed from breakfast to bedtime with power to spare. The battery often had 30% or 40% capacity left at the end of the day, even with moderate to heavy usage and the screen brightness cranked up. It really performs quite well and should deliver enough juice for most users. The Vivo 5 has limited power management tools. You can choose to enable "standby intelligent power saving" if you want. This cools off background processes when the phone is not being used. That's about it. The phone supports rapid charging, but not wireless charging. It was able to go from 30% to 100% in just over an hour. The Vivo 5's secondary radios did their job without complaint. The Bluetooth radio let me pair the phone with headsets, speakers, PCs, and my car. Voice calls sounded OK through a headset, but pretty bad in my car. The quality of music playback was below average; I've heard much better. Google Maps worked hand-in-hand with the Vivo 5's GPS radio to locate me swiftly and accurately. The phone often pinpointed me in just a few seconds, with accuracy as good as 20 feet. The Vivo 5 worked great as a navigation device and search tool for unearthing nearby spots of interest. The WiFi radio didn't give me any trouble at all. The Vivo 5 doesn't have NFC. Blu is not only a fast-growing company, they're a fast-changing one as well. Most Blu phones to date have been cheap, plastic, and loaded with plain Android. 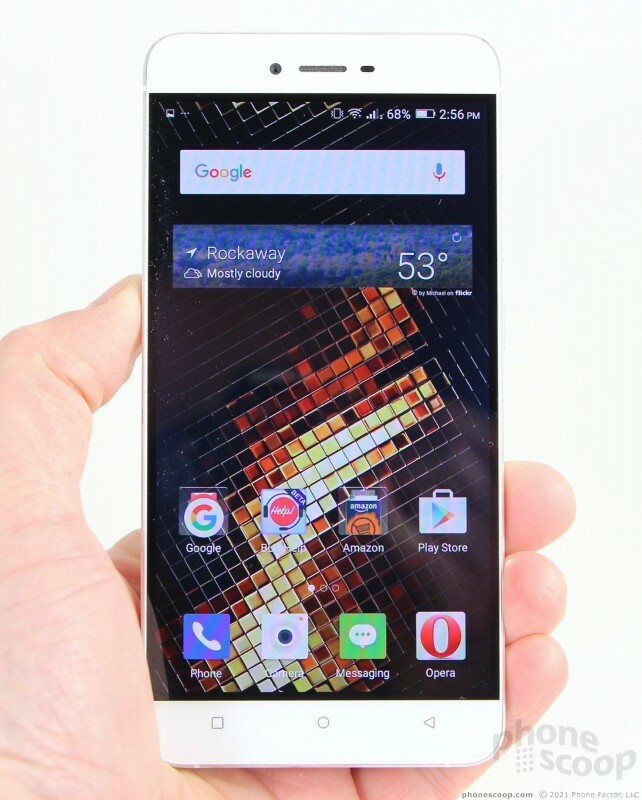 Blu today announced the Vivo 5 and Vivo XL affordable Android smartphones. Both have a premium design, and similar specs. if this had Band 12, this could have been Blu's breakout phone. Pretty decent style and performance for the price, but no band 12 means its all but worthless for all those millions of Tmo MVNO customers out there.